Twelve middle aged women in fuchsia tops are dancing in the middle of the street. Their chirpy music mingles with the lounge soundtrack of the Starbucks terrace. I’m on Shamian Island, where colonial powers established their residence in old Guangzhou. Heavy European architecture, stucco, balustrades, pillars. If it wasn’t for the dancing ladies, the tropical heat and the dangling roots of the giant trees, I could imagine I was in Prag, Berlin or Budapest. But I can’t think away the heat, the trees, or the people. I’m in southern China, late summer, with a mild film of sweat over my face. I rolled up my jeans to let my legs breathe. I was in that exact same seat two years and a half ago. Back then, I was living in Nanjing – it was freezing winter up on the Yangtze, and for Christmas, I fled south. I stopped over in Changsha for a day, and arrived in Guangzhou on the night of Boxing Day. I still remember that feeling, getting out onto the street at FangCun subway station. The air was welcoming. I bought peanuts from a street seller, then bananas on LuJun Jie, where I walked among plastic tables where locals enjoyed late night barbecue. I walked along the Pearl River, sipping milk tea. Teenagers were out with skateboards. And I felt happy. The next day, as I did this morning, I crossed the river on a ferry, looking out the window at the grey waters of the Pearl River. I walked along the stalls of the Fish Market, past piles of polystyrene boxes, mounds of seashells on the floor, among the strong smell of mud and water. I walked along the canal, under the dangling branches of evergreen tropical trees. I crossed a bridge, and arrived on Shamian Island. Then, I settled on the terrace of the Starbucks with a cup of espresso. I felt safe, home, happy. Over the course of my travels, I have gathered the memories of a few such happy places. There is a food court in the Singapore Chinatwon, where retirees gather after dark for cheap food and beer. In November 2014, after a difficult year running my first festival and applying for a PhD, I spent long hours there, finally resting, reading Watchmen and drinking addictive sweet coffee. This is the background image on my iPad. There is another food court, in Penang, on the seafront. I sat there with Philip in early December 2008, eating curry, fried chicken, ice Kacang. We were getting to the end of our three month overland migration journey, and after exhausting times in China, Vietnam, Cambodia, Thailand, we felt that in Penang, things became easy, we were getting close to our new home, and we could breathe. There is a cafe in Chippendale, in Sydney, where I sat down after my first major talk on the Chinese Internet in 2014, and again, after finishing a major stretch of work recruiting candidates for the first round of CAMP. It’s a little hipster place with fancy muffins, light blue pat, second hand wooden chairs, across a park and a new residential development. There is a Bench in Queenscliffe, overlooking Port Phillip Bay. In 2011, I took an emergency two-day off there, after incorporating Marco Polo Project. I walked along the ocean to Point Lonsdale and, halfway through the walk, felt dizzy. It was evening, I was alone, and thought I might simply collapse there, from sheer exhaustion. I pause, I breathed, I looked at the waves. I slowly wake de all the way to point Lonsdale, trying to leave the burden behind. I made it there. A bus took me back to Queenscliffe, where I sat on the bench, looking out onto the water. There are other places, but these mostly come to mind. These are places I reache after a feat – a difficult and transformative experience. There, I felt I could pause, relax, and take the time to regain strength before I start again. Is is what I am doing today. I just completed my first report for the Global Challenges Foundation – this has been one of my most difficult, if rewarding, professional experiences. And before I start again, or move on to something else, I need to take some time in my happy place, to renew. Katie Keys : poet @tinylittlepoems · 6 sept.
Katie Keys : poet @tinylittlepoems · 7 sept.
Katie Keys : poet @tinylittlepoems · 8 sept.
Katie Keys : poet @tinylittlepoems · 9 sept.
Katie Keys : poet @tinylittlepoems · 10 sept.
Katie Keys : poet @tinylittlepoems · 11 sept.
Katie Keys : poet @tinylittlepoems · 12 sept.
Katie Keys : poet @tinylittlepoems · 13 sept.
Three days to the Marco Polo Festival! It’s been eighteen months at least since I first sat down in Little Lonsdale Street to discuss an idea for a program that would bring together writers and readers from Australia and China who embraced the internet as a key part of their practice – combining online and offline events. Preparing a Festival takes a lot of energy, and as a result, I’ve been a bit silent on this blog – but I haven’t exactly stopped writing. One pleasant aspect of working as a Festival Director is the level of attention you get – even when you’re just running a junior, first time gig – and I was able to publish a few things over the last month or so: a piece on Translation in Writer’s bloc, another on ‘Translating Asian Voices in Australia‘ in Peril Magazine, a Q&A with Writers Victoria, and an interview with the new Tongues magazine. And now Festival time is a-coming – we’ll be talking all things digital and cross-cultural, sometimes all in English, sometimes in two languages. 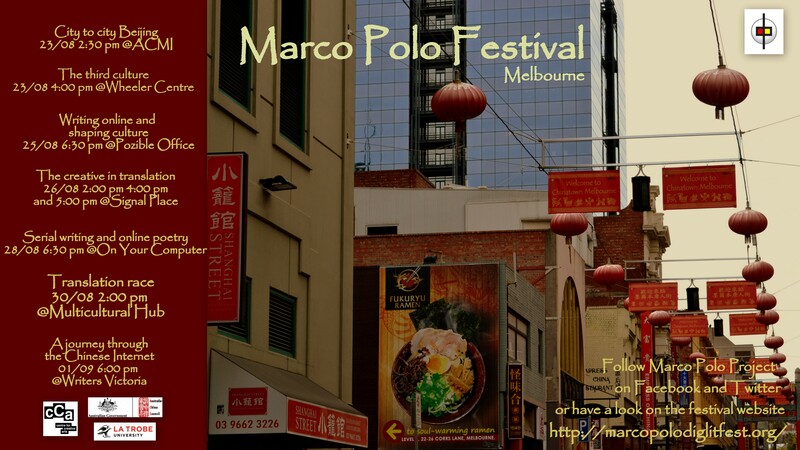 And I look forward to sharing ensuring thoughts and meditations here, or on the Marco Polo Project blog. Meanwhile, if you’re in town, come along and take part in the conversation! I’ve been to class once in the last month, and I may not return. I don’t think I’m a lazybones, my Mandarin has been growing steadily, and I have made significant progress on all projects I came here with. But classes have been a great disappointment. I’d like to reflect more on the reasons why I decided to no longer attend the course I enrolled in. Superficially, my decision was based on a simple premise: attending classes required considerable amounts of energy, but only yielded limited results in areas of low priority for me (specialised vocabulary and advanced character recognition). On a personal level, my teachers were enthusiastic, smart, and encouraging. But the shape of the course and evaluation, rather than serving as a learning accelerator, was a cause of stress and made me passive – impairing the goals I had set myself, whether for cultural understanding, network development, or actual language learning. The contradiction became very manifest after I returned from a trip up North to meet a number of partners in a literary project I’m putting together. And again, after a trip to Shanghai attending a conference on Social Enterprise models. My teachers already knew I was doing a lot outside of class, and I told them I wouldn’t sit exams. Then I stopped attending, and shifted my focus outside. I have written elsewhere about the lack of personalised goal-setting, how classes lacked proper differentiated learning, and how I ended up in a class too difficult for me, but with a more suited learning speed. These factors played a role in my decision to stop attending university. But the core reason is more fundamental: I developed a radical lack of trust in the system. That lack of trust started through rumours and hearsay, voices warning me that the Chinese education system was teacher-centric, inefficient, dull. I arrived doubtful, and was not proven wrong. After a month, I entirely stopped believing that Nanjing University and I shared a similar goal – increase my ability to speak, read, write and understand Chinese based on my current level and future needs – but started to believe instead that the system has a goal of its own, and would not hesitate to trample over me for the sake of its internal logic. From the start, and at a very material level, the university didn’t seem to care much about my well-being, or that of my fellow students. Registration was one of the most painful administrative processes I ever experienced. I queued for a total of 7 hours over two days, not knowing at any point whether I had all the required paperwork, or would need to come back again, and encountering nothing but seemingly rigid bureaucracy. Later, I shifted levels upwards from ‘Gao Xia’ to ‘Wenhua Ban’ because the speed of progress was too slow, but also because one of the classes had no working air-con. Daytime temperatures in Nanjing vary from 35 degrees in early September to 4 degrees or less in December. After two days of heavy sweating in class, temperature control didn’t seem a trivial matter anymore, and I chose the class in a room with air-con. These negative experiences had nothing to do with the curriculum – they shaped my experience nonetheless, and from the onset, made me doubtful about the level of care that students could expect from this institution. Evaluation, however, was the root of the problem. In both ‘Gao Shang’ and ‘Gao Xia’ classes, teachers announced weekly ‘dictation’ tests on new vocabulary. I didn’t sign in to be failed for lacking skills I never intended to build. Hand-writing disconnected lists of new words is far from my top priority. In our ‘Oral Chinese’ class, a core part of our final exam will require us to write a short essay (by hand), and a vocabulary test. Isn’t the class about spontaneously telling a story, or taking part in a conversation? That’s my goal at least, and a legitimate one I think. If a test is not adequately measuring against learning goals, then how can I trust that it will reveal anything about my success or failure? More importantly, how is it going to tell my teachers – or myself – anything about my future learning needs? And if it doesn’t – should I still attend the classes that prepare for it? Maybe I should have asked for special treatment – but the culture was far from inviting to that option. Universities are complex institutions, with their own performance management systems and internal feedback loops. Student evaluation occurs within this framework, and is not exclusively based on pedagogy. Beside, students from different backgrounds carry their own expectations, and vocabulary quizz may be what they wish to be tested on. I’m an atypical Mandarin learner: whether the system is radically flawed, or whether it simply doesn’t suit me, I’m not sure. Trust is a personal matter. Maybe these early weeks I did attend class had a positive effect on me, maybe they simply taught me what I needed to study. In the end, my Mandarin did improve significantly over the five months I spent in China, I learnt a lot about the country, and I’m now collaborating with local student clubs to run translation workshops – not to mention the networks I built and projects I progressed. It has been a superbly valuable stay. Still, I feel that something was wasted. My own time and early enthusiasm; the time and skills of my teachers; and the learning bond I could have made with my fellow students. I wonder how often learning institutions fail in their mission because students stop trusting them, and whether it’s a problem with no solution – that some individuals will just always be dissatisfied by the system – or whether there are simple (or complex) ways to make the situation better, and develop stronger trust between teachers, students and curriculum designers – and people attending learn better. Internet has been the lowlight of my time in China. Unreliable, slow, and expensive. At home, I used a 3G stick from China Unicom: 300 yuan for nine gigabytes, three nationally, six locally. The first one went quickly – I bought a second from a small shop, which turned out to be registered in another province, and so ran out after three gigabytes of usage only. Neither anger nor diplomacy got any result from the shop ladies, so I bought a third stick, which has lasted me till now. Overall, the connection was highly unstable and slow, with or without VPN. As for cafes (or even youth hostels), WIFI quality was a regular source of frustration – it varied from place to place and from day to day, without any clear explanation. Bad internet connection affected my mood and productivity considerably. I run online projects, I have collaborators in Australia: if I can’t get online, I can’t work. As time passed, my patience wore off, and in the last month, I have seen myself give up a few times before midday, after spending long periods of time re-loading pages in between timeouts. Hardware issues made the matter worse. I bought a MacBook Air in October 2012 – it came highly recommended, and indeed, I found it amazingly practical to use. Then in October 2013, while I was visiting a friend in Tianjin, just before a week of back-to-back meetings in Beijing, my computer crashed: a flashing folder with a question mark appeared on the screen when I tried turning it on. The SanLiTun store delivered harsh news, my flash-drive needed changing – all data was lost. More annoying, they didn’t have a spare part. After much insistence, I got them to order the piece in a Shanghai store, and set up an external boot-disk, so I could use my computer in the mean time. Planning an appointment in Shanghai was another ordeal – their complicated and all-in-Mandarin online appointment system didn’t work, and the phone assistant refused to help. But in the end, I got my computer fixed, and an apology from the manager for the bad experience over the phone. All important data was on dropbox and google docs, and I got over the annoyance. Then four days ago, as I was browsing the net at a friend’s house, my screen froze. The flashing folder was back. I went to the Shanghai Apple store this morning, and got the same harsh news: my flash-drive died. They were decent enough to recognise that after three months, this was an embarrassment. ‘SSD drives never break’, said the guy from the Genius Bar. But they didn’t have a spare part for me, so I’ll have to get the thing fixed in Melbourne. Fortunately, I bought a warranty extension in October – so won’t have to pay extra. And fortunately, I did regular back ups on time-machine, so won’t lose much data. But the Shanghai people weren’t able to properly order the piece for me in Australia – though they did say they would try to send an email – which means possibly more back and forth trips to the Apple store in Chadstone. These IT issues have been a constant drain of energy throughout my stay in China. It’s hard enough to deal with everyday interactions in Mandarin, get used to a new country, make a new set of social contacts, all this while preparing two collaborative international projects and studying the language at an advanced level. Now imagine the same thing with your tech cyclically breaking down, and no reliable service to fix it. I guess Apple was alright, in the context of China. Their phone service is a nightmare, their repair did last for only three months, and they’ve got a short stock of crucial spare parts. More generally, multiple details in attitude and expression, which could be summed up as ‘cultural differences’, added to the sense of frustration. But I did manage to get a temporary boot disk, and the technicians in store were polite, understanding, and helpful to an extent. * I learnt to let stuff go. In general, I’m a reliable planner: I give myself a list of things to do, and then I do it all. For the last month, I slowed down, both socially and professionally. There’s emails I may never send, blog posts I’ll never write, New Year’s greetings I’ve missed, articles I will not translate. That’s OK, when I get back to Melbourne, ‘where things work and people smile’, I’ll take stock of my losses, and start afresh. * The frustration of unreliable tech gave me direct emotional insight into the multiple frustrations that people in China live through every day. It explains the tired faces and the cynical words, both among locals and expats. The frustration extends beyond tech – it’s everywhere in a society where service and infrastructure is unreliable. I’ve come back to my reflections on trust – as I learnt, you can’t even trust an Apple computer to work here, or a repair from a genuine Apple store to last over three months. Gradually, you trust everything and everyone less. * Finally, my interactions with Apple were a great opportunity to reflect on culturally hybrid spaces, and the particular challenges they pose to globalising economies. At every step, my relationship with technicians and customer service people was distorted through a number of lenses – my attempt at adopting a ‘Chinese’ mode, their attempt at servicing a ‘Westerner’, and our common struggle to fit these cross-cultural efforts within the framework of Apple’s generic service processes. I came here to learn the language and the culture. These tech issues were very painful, and they did harm projects I was trying to set up from here. But they might have made my learning better – so that ultimately, I’m not unhappy that I had to face them. A four month stay abroad will have highlights and lowlights. And I believe the wisdom of a true cross-cultural learner is to take both of them in. Learning is not always pleasant in the moment it happens. Sometimes, what you learn is even slightly grim. But you’re still that little bit wiser, and better ready to face the future. A common trope of language learning advice is that you don’t need in country learning anymore, since you can design your own linguistic environment anywhere. This is both entirely true, and extremely short-sighted. Indeed, with online news, TV and radio, international communities, and resources like lang8 or skype teachers, it is entirely possible to build one’s own ‘in-country-like’ environment. But how much effort and willpower does it take to craft and maintain this environment. I taught myself Chinese, most of it outside China, and passed an HSK 5 last year. I am the living proof that you can self-teach outside China. Yet I am a very strong advocate of in-country learning. I’ve been in China for just over four months now, skipped about half of my classes at uni, and made more progress than I would ever have in Melbourne. Necessity has a force of its own. I needed Chinese for my everyday life, and I needed Chinese to fix issues at home. More importantly, I needed Chinese to develop a social life – I soon had enough of the local expats, and most of the locals spoke only minimal English. On average, my friends in Shanghai or Beijing don’t speak Chinese as well as those living in second-tier cities. They never properly learnt, because they never had to. Learning a language is an extremely demanding task, not just intellectually, but emotionally. Suddenly, simple cognitive tasks become significantly harder than they used to be – suddenly, you’re no longer able to perceive or express intellectual subtleties – and you feel exhausted all the time. The temptation to give up is extremely high, no matter what level you’re at. Learning at home is all very well, but by the time you’ve carefully blocked out all English and crafted your Chinese bubble, do you still have the moral strength to stay there and learn, or resist the many temptations of home – the cup of tea, the phonecall, the facebook page, the drinks with friends. That’s not to say you cannot succeed – I managed. But every step requires a double effort – not only learning, but also keeping that artificially constructed second-language environment alive, possibly keeping out friends ad family who will bring you back to your mother tongue. In country, you can just focus on learning, and every step forward is a step towards more social integration. Language is a social bond, that creates emotional and intellectual communities. And for that reason, I believe the is nothing like in-country learning to build the necessary motivation. For that reason, scholarships sending students in country are extremely valuable – and I am very happy both that I was able to receive one, and that our government was enlightened enough to set them up in the first place.